Rolled out of my motel room fairly early and made tracks for Sedalia on Hwy. 50. 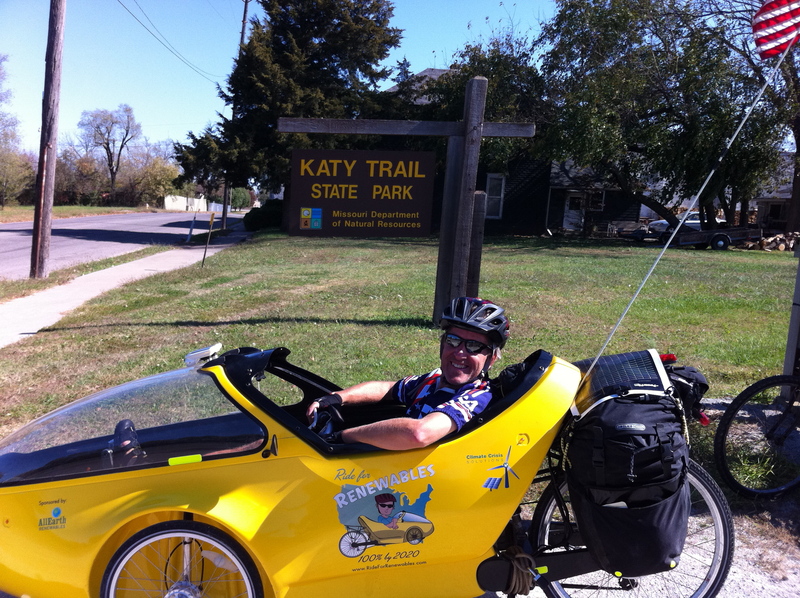 Hit some more rumble strips on the narrow shoulder, so was relieved to finally reach the KATY Trail in Sedalia. Before hitting the trail, made a quick stop at the Sedalia Democrat, which took a shot of the trike and said they’d run a story. For those not familiar with the KATY Trail, this is the nation’s crown jewel rail-to-trail bike path. Hats off to Ted and Pat Jones (of the Edward Jones investment family) and the Missouri Department of Natural Resources for creating this national treasure! The bike path is 225 miles long and crosses most of Missouri. I’ll be biking 150 miles of it, with most of it following the beautiful Missouri River. We need bike trails like this in every state. If fact, we need a national coast-to-coast bike trail for the American people to be able to safely explore this great country by bicycle. I had wondered how the tires of the rocket trike would do on chat (the finely crushed gravel they use on this trail), but it turns out there was no real cause for concern. On the first section at least, the trike cruised better on this than on any paved road I’ve ridden on thus far, and what a relief to be away from all the cars, trucks, noise and exhaust. The beauty of riding on leaves and being nestled in by a canopy of colorful trees is just indescribable. My favorite ride day so far. Had an energy crash late in the afternoon, but took care of that by consuming some Chocolate Almond Butter from sponsor Justin’s Nut Butter, along with dates and dried apricots. That powered me all the way to New Franklin. Made the campsite in New Franklin just as the sun was setting, riding by some Boy Scouts setting off a rocket in a field. That brought back memories. Pulled into the campground, set up the tent, and rode through the campground to share it with the scouts. They loved it. Met a couple of cool bikers, Rock Warmsley and Marcus Ware, who had passed me earlier on the trail. Enjoyed some great conversation over cold beers and a campfire before calling it a night. Today was the most physically challenging day of the trip thus far, but in a good way, as the relatively flat terrain made for extended stretches of pedaling. Knocked out 72 miles. Didn’t engage the electric motor once on the trail, as I wanted my first experience with Katy to be pure. Looking forward to seeing what tomorrow holds. This entry was posted in 2010 Ride, Blog, Video and tagged justin's nut butter, katy trail, ride for renewables, sedalia. Bookmark the permalink.